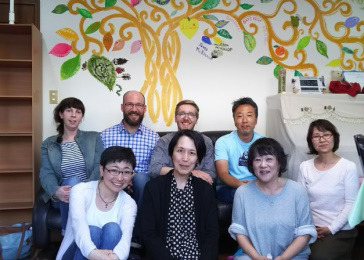 A group of researchers at ILC-UK have visited Japan from May 15 to 19 (1 week), interviewing experts and conducting site visits to learn population aging in Japan and issues associated with it. In response to their request, ILC-Japan has arranged their schedule in Japan. 16:00 Site visit to "Nagomi-no-Ie", a place for neighborhood people of all ages to gather and be together. 10:00 Site visit to “Days! BLG,” a new type of the day care center for the people with dementia, making the wishes of them to work come true. 16:30 Site visit to "Nagomi-no-Ie", a place for neighborhood people of all ages to gather and be together. Brian joined the ILC-UK in June 2013. In this role, he has conducted research on a range of topics related to population ageing, such as loneliness, serious illness, and housing, with his main expertise relating to the issues around employment in later life. He has worked on this subject and the changing nature of retirement for nearly 10 years, most recently with the three reports in ILC-UK’s The Missing Million series published by BITC. He is also an active member on various strategic and advisory groups with universities, the voluntary sector, and government as they examine older people and the world of work. Brian received his doctorate in 2016 from the University of Oxford, studying at the Oxford Institute of Population Ageing, where he explored how the concept of employability plays a role in the labour market behaviour of older workers, in England as well as in different European social policy contexts. Prior to this, he worked in the International Affairs office of AARP in Washington, DC, where he helped organise a number of international dialogues and conferences on issues related to population ageing. 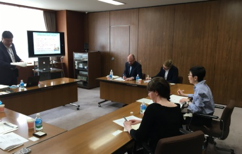 His work also included fostering AARP’s on-going collaboration with the United Nations Programme on Ageing, conducting outreach among the diplomatic and research communities. Prior to his position at AARP, he completed the TransAtlantic Masters Program in Political Science through the University of North Carolina at Chapel Hill and L’Università degli Studi di Siena, Italy. Through this programme, he gained extensive knowledge on European Union institutions, the process of European integration, and European welfare states. He speaks French and Italian, with varying competence in German, Portuguese, and Spanish. Sally-Marie Bamford, Director of Research and Strategy joined the ILC-UK in March 2009, and has worked on a number of high profile research projects, including work for the Joseph Rowntree Foundation, Age UK and the Department of Health. Prior to joining the ILC-UK, Sally-Marie held a variety of posts in the charity and political sector, researching and writing on social care, workforce development and equality and human rights. She also worked in the European Parliament as an advisor and as a speech writer at the Equality and Human Rights Commission. Sally-Marie has a Masters in social policy and research and is a qualified NCTJ accredited journalist. Sally-Marie has a particular interest in equality and human rights for older people, dementia and older people with high support needs. This year Sally-Marie will be working on a number of projects, including dementia and prevention and health seeking behaviour across the generations. George joined the ILC UK in July 2014 after graduating from the University of Leeds with a First Class Honours Degree in Politics. Now Research and Policy Manager, George has a keen interest in demographic change, with his research focusing on health and social care policy. He has authored a number of major reports in his time at ILC-UK on a wide range of topics, including SOS 2020: Creating a Sustainable 21st Century Healthcare System, Drink Wise Age Well: Alcohol Use and the Over 50s in the UK andThe Future of Transport in an Ageing Society. George has been quoted on his research in both print media and radio, and the abstract of his paper Drink WIse, Age Well has recently been accepted to present at the British Society of Gerontology 2016 Conference. Copyright © International Longevity Center Japan All rights reserved.